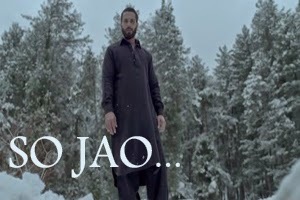 Lyrics Of So Jao From Haider (2014): A Playful song sung by Bashir Lone, Bashir Bhawani, Muzamil Bhawani, Mayukh Sarkar, Sourabh Joshi and Alaap Mazgaonkar featuring Shahid Kapoor, Shraddha Kapoor, Tabu and Kay Kay Menon. The video of this song is available on youtube at the official channel UTV Motion Pictures. This video is of 1 minutes 36 seconds duration. The audio of this song is available on youtube at the official channel Times Music. This video is of 2 minutes 24 seconds duration. Lyrics in Hindi (Unicode) of "सो जाओ"